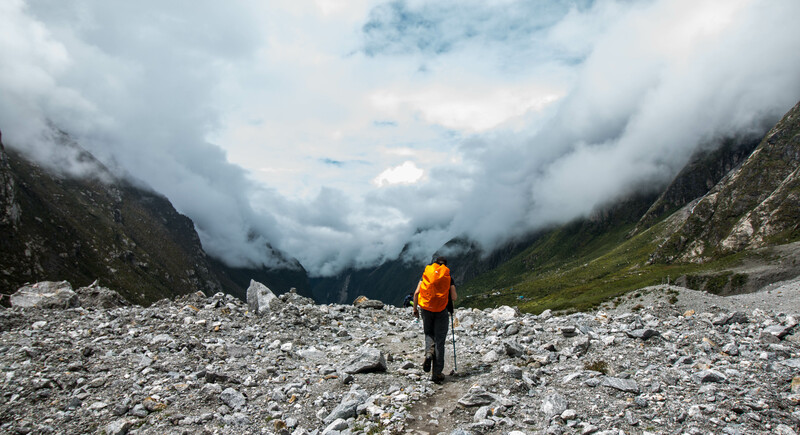 The Langtang Valley – which is only a stone’s throw away from the capital city of Nepal, Kathmandu – is one of the colourful, culturally affluent, and diverse-in-landscape trekking routes in Nepal. For its majestic performance of the Langtang Himalayan Range, with more than a thousand of varieties of ornamental flowers and plants, birds’ and mammals’ species – combined – exceeding to 150 in numbers makes Langtang Valley an ideal address for, both, extreme and casual trekkers. But, later the last year’s earthquake on April 25, 2015, the Langtang Valley had to share not only the worst consequences of the earthquake, which wiped out the entire settlement of the valley, but following the shock waves, aftershocks, and constant landslides; the valley topped the front page of many newspapers, exclusively, for its catastrophe reports. Likewise, we weren’t sure if our idea to trek the Langtang Valley was actually a good idea or it was just a rush of young blood to the head. Whichever the case it was; we did it and we couldn’t have a better name to label our Langtang Valley Trek, but the “Beauty and the Beast”. We began our journey from Syafrubesi around 9 in the morning. Though it was already in the middle of the September, but the monsoon season – particularly in this year – seems to be stubborn enough to give up its usual routine. We had to start our journey wearing raincoats. Moreover, because of the recent landslide – we were encouraged not to take the common route, but to climb a difficult slope to reach the Lama Hotel (first station to spend a night before heading to Langtang Valley). We did as per the suggestions, except we had no idea if we were following the correct path or we were just walking against the force of gravity, solely to get lost in the middle of nowhere. After a few hours of uphill walking, we saw young potters carrying a heavy load on their backs, perhaps double the weight of their own body, and when we asked them if we were on the correct path. They said “we all are in the same boat”, and they were also going to the Lama Hotel. Of course, we asked them how long would it take to reach the Lama Hotel, and this is something funny when I remember because of every time we asked any locals that how far we were from our destination, they would always reply smiling, “three hours”. After four hours of intense walking, we reached Sherpa Gau – a mini stop before reaching Lama Hotel. We stopped at a little tea house, for a small break, but we paused there for almost two hours. The owner, an old Sherpa man, said the route we took, giving up the usual course, used to be an ancient route before the new route, so-called customary route, was promoted. After three hours from our latest stop, Sherpa Gau, we reached Lama Hotel – a place where we could rest and sleep, a relief. We started our day early from the Lama Hotel. 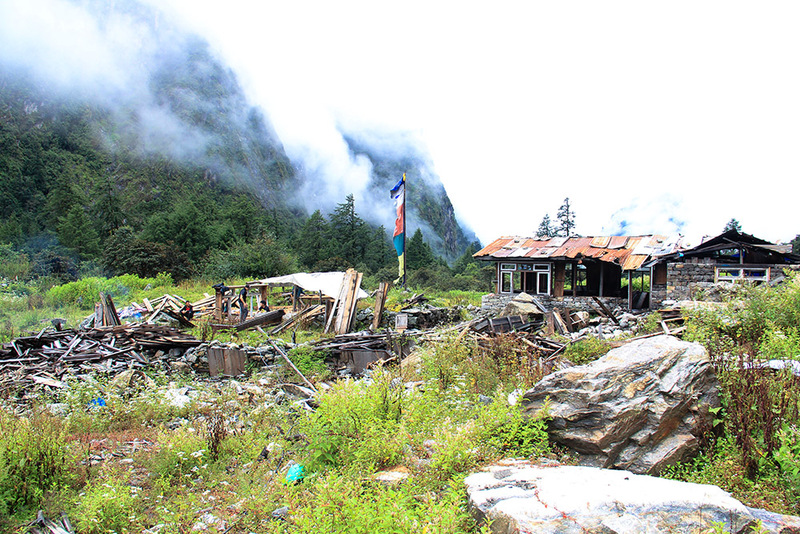 We were planning to stay at Kyan-jin Gompa, skipping a traditional lodging decision at Langtang Valley. I must say, the greenery and vegetation at the route are stunningly beautiful. During our trek from Lama Hotel to Kyan-jin Gompa, we saw various episodes of flowers, plants, and trees, which gave us an impression of being in a wonderland. Teahouses of Riverside and Woodlands have escaped the rage of the earthquake, but watching Godha Tabela in such a vulnerable state, made our heart burst. Nature is beautiful, but she can be cruel, at times. 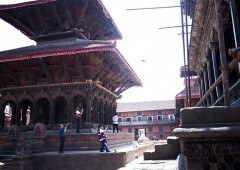 But on the positive side, people are working to reconstruct the Godha Tabela. We paused there for another few minutes, had a little chat with the workers, and we engined ourselves to conquer the Kyan-jin Gompa. 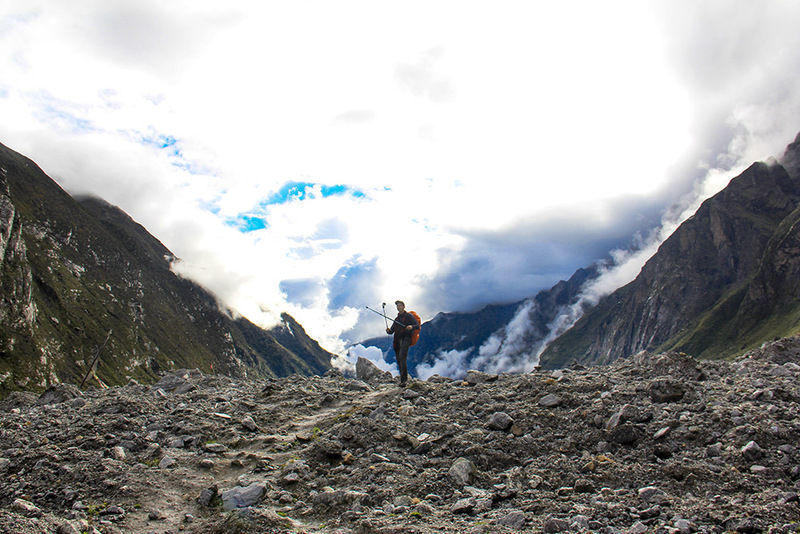 Following the sound of the strong Langtang River, on the way – we saw a series of landslide and several trekkers. To our surprises, we saw more tourists than we had expected. Some of them were alone and some them had a huge team. But, everyone was friendly; we were friendly, the entire environment of the Langtang Valley is friendly. Every then and now, we would stop a few minutes to talk with the returning trekkers and ask them about the status of Kyan-jin Gompa. We stopped at Thanshep for lunch. There, we met a Japanese couple returning from the Kyan-jin Gompa. They said due to foggy weather they could see very little of the mountains. But before leaving, they wished us for the clear weather and we exchanged our farewells. Perhaps, their prayers were heard because after the lunch, gradually the foggy weather started to getting transparent. Finally, we could see Mr Blue Sky and the shy mountains, hiding behind the curtains of the clouds. That moment, that very particular moment, we felt nothing – no pain – but a fire in our heart that how we wish we were a heard of birds, we would fly right then and kiss the peak of the mountains. The valley looked so dreamy, we couldn’t believe eyes as if we were watching a real landscape or some sort of HD Wallpaper. 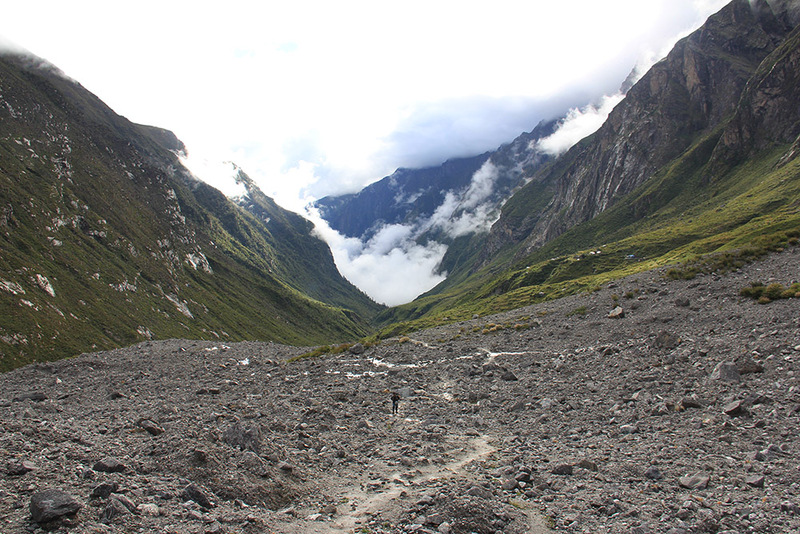 But the Langtang Valley; there was nothing but pebbles and rocks. Entire human settlement got wiped out, leaving only one home. I guess we were not ready to see such destruction after crossing the heavenly presentation of nature, however, we had to move on – we had to cross this valley to reach the Kyan-jin Gompa. It almost took us half an hour to cross this demolished settlement. We stopped at the new Langtang settlement, the recent commercial centre built right next to the old one. 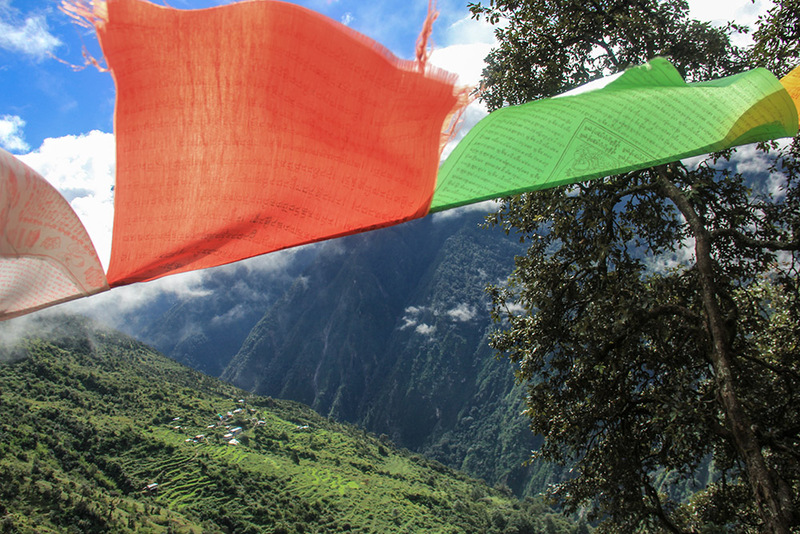 By the way, if you remember when I said we had met young potters, earlier, they had asked us to carry and deliver Buddhist prayer flag to one of the teahouses in the new Langtang. We settled at the respective tea house for a cup of tea, delivered the Buddhist prayer flag, and geared ourselves to move on. On the way, owners of the little teahouses, from the new Langtang, would advertise and ask us to stay a night at their places. The present condition of the new Langtang looks very weak; they need business, and after the earthquake and massive destruction, they need more business than before. We promised one old woman that we would certainly come to her place for breakfast. After two hours of silent and tiring walk, we reached Kyan-jin Gompa at 8 in the night. At that point, we couldn’t be more proud of what we achieved against all the comments we had to face in Kathmandu. Our families discouraged us from visiting Langtang because of the safety issue, our friends were not sure if the Langtang Trek was a good idea or not. But we did it, and if we had not done it, we would have missed so many things. Friendly people, green vegetation, constant rain and sweat, and the wonders of nature. Even though the entire trek was foggy, but it was literally a different feeling. 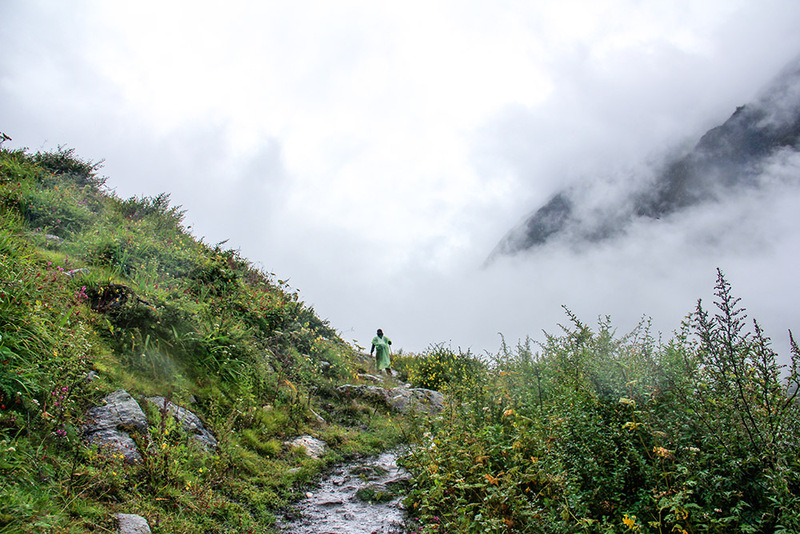 No regrets that we couldn’t see the clear view of the mountains, but the only minimum people do Langtang trekking during monsoon season. We can, finally, count ourselves in that list. In two days if we could reach Kyan-jin Gompa from Syafrubesi, against the evidence of the landslide and earthquake, we can certainly conclude the Langtang Valley is way safe to trek. Langtang Valley, though it is my first time, is such a beauty; I have promised myself that I will visit this place again, not only because the place needs business, but this place is a little piece of heaven on earth. This entry was posted in Nepal, Trekking, Tours by royalmt. Bookmark the permalink.